The Vizio 2016/2017 M-series is a value oriented HDR 4K LED TV that we were eagerly awaiting. The M-series has 64 active zones of full array backlighting compared to the 32 last year 64 on the P-series 4K Vizio. Vizio's new spacial scaling engine is much improved for this year. Pricing for this new Vizio offering looks to be a game-changer for the year. It's a top mid-value model, maybe the best. There is a lot to discuss in picture quality. There are not a plethora of options out there for 4K content and this makes testing and evaluation more difficult. This means that upscaling to the native 4K resolution of the panel takes on significant importance in our evaluation since most everything you will currently watch (1080p HD, 720p HD, 480p/i standard def) will have to be upscaled. For this reason, we choose to rate the picture quality rating and notes based mostly on those lower resolution signals rather than 4K. The picture quality understandably varies based on the source. BluRay, Broadcast and streaming video from the Amazon Instant App are very defined and excellent, taking advantage of some of that 4K resolution. Netflix content was somewhat softer, but still accurate and colorful. The spacial scaling engine in the M-series is responsible for upscaling from HD to UHD. Owing to the lack of the ability to stream the limited 4K content available, this is the most important qualitative aspect of 4K UHD TVs. The new M-series Vizio does an exceptional job of upconverting 1080p content. Edges are clear and detail greatly enhanced by the resolution as it should be. Why else buy a 4K TV right? Vizio gets a passing grade but nothing more as the TVs Sharpness is too much even after picture setting adjustment. The Pure Pixel Processing Engine is another welcome addition that reduces noise and improves picture quality from a compressed source. One of the most notable features of the M-series is the 64 Zones of LED full array backlighting. This system beats edge lit backlighting in a couple of important ways, namely better contrast and black levels in certain situations and better side angle viewing quality. Toggling the Active LED Zones setting back and forth revealed the better contrast in areas of the picture where the feature increased contrast. While the zonal manipulation is a clear benefit, I believe the full array backlighting is the greatest qualitative difference maker here. Black levels appeared very saturated, and once calibrated colors looked great. This TVs got lots of pop for the price in the picture category. 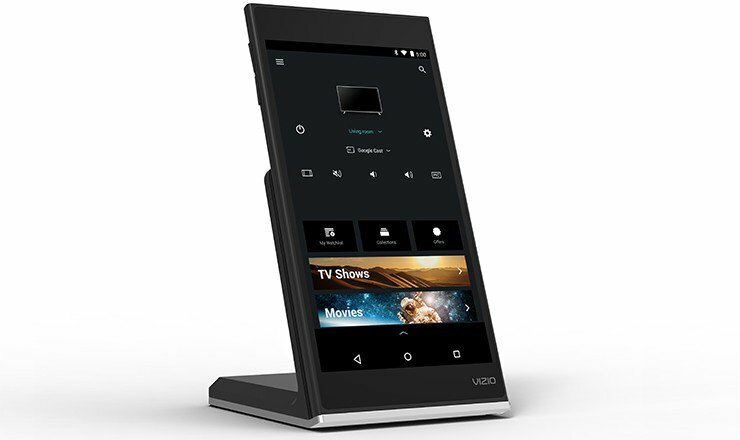 A 360 Clear Action Rate (720 CAR on 60” and larger) is Vizio's backlight scanning feature that amps up the native resolution of the screen for better fast action performance. There are times when this is helpful like with sports, but it should normally be kept Off. Turning the Reduce Judder setting Off will enable some noticeable judder, but you get used to it quickly. As usual with all LED backlit LCD TVs, the M-D series Vizio is no exception in that contrast and color saturation are reduced at side angles. However, the full array backlighting with 64 zones combined with a quality panel that doesnt produce much glare do a good job to control the reduction in contrast. My best estimates are a 20% reduction in contrast from around 30 degrees off center. From 15 degrees off center, you're looking at around a 10% reduction in contrast on the VA (vertical alignment) panel models (all except the 60”). One of the greatest traits of local array LED backlit TVs is the beautiful lighting effects from on-screen windows and on-screen in room lights. It can add a neat visual effect and make programming more 3-dimensional. But it takes a little getting used to for purists as it can be extreme enough to cause the picture to look less realistic, basically diminishing natural background blur. The good news about this is that it did not often bleed over into shadows. When watching a couple of darker scenes from Star Wars we felt backlight uniformity was much better than the P-series. How it will age is another story. Often LED backlit LCD develop some clouding and unevenness in dark scenes over time. 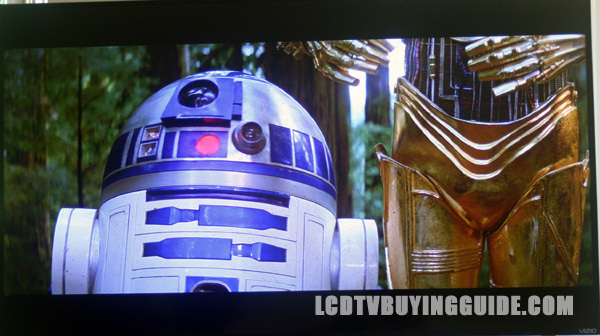 Clarity and detail looks amazing on the Vizio M-C series from the BluRay version of Return of the Jedi. 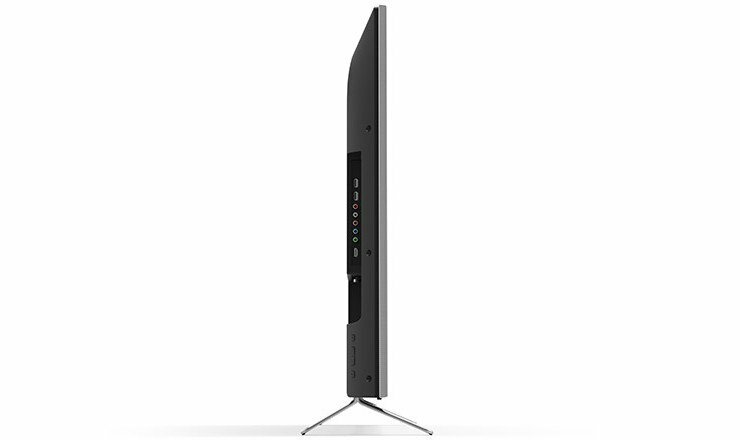 We mentioned before that there are 64 separate backlight zones in the M-series Vizio. As mentioned above we recommend leaving the local dimming setting on for enhanced contrast and black levels. Performance here was very good as this can be such a detractor with LED backlighting. This category of performance often changes over time but at the time we tested the M-series, we noted a bit more light coming from the center of the screen which makes sense since it has full array LED backlighting rather than edge lit. 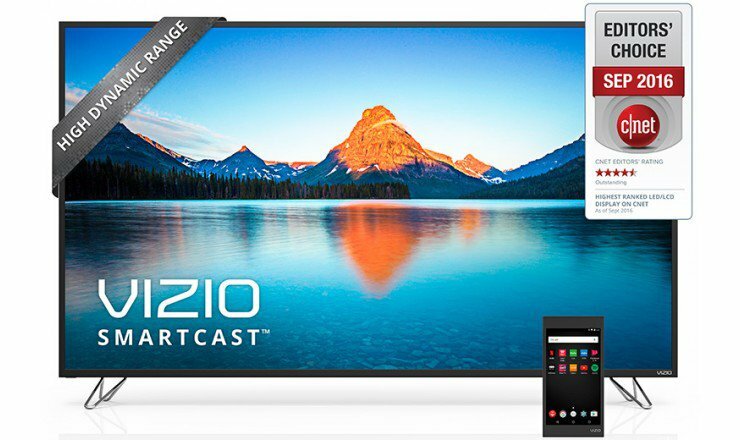 All Smartcast products from Vizio have Google cast built in to them. You really get a great selection of Apps, the most of any device except for Roku. This is a huge improvement over past Vizio models. The one big exception is the lack of Amazon Video which is a valuable App to miss due to being one of the only ones carrying 4K and HDR content. The controller for the M-series is the slick 6” full fledged Android Tablet Smartcast remote. It's tap and swipe functionality is comfortable for our smart phone user society. I understand why Vizio went here with it. It comes with a wireless charging dock, 8 Gb of storage and a quad core processor. Once you find what you want to watch on the SmartCast App you just tap it to take it to the big screen. Overall, it's a cool addition but it doesnt compare to the value of the picture quality as a reason to buy. And it creates a bit of work for those that just want to plug and play. A separate little standard remote is included as well. Stand Design - Stand Design - I'm not too crazy about the crome wire stand feet. They dont really add anything to the design, they may even take away. The slate brushed charcoal bezel is nice, understated and uncomplicated. I like it. TV Design - The side profile of half an inch is designed to look slimmer than the 2.5” depth of TV. The slate brushed charcoal bezel is nice, understated and uncomplicated. I like it. I was impressed by the balance and quality of the speakers on the M-series. Volume from the 2 X 15W speakers was very loud even at only 40% volume level. 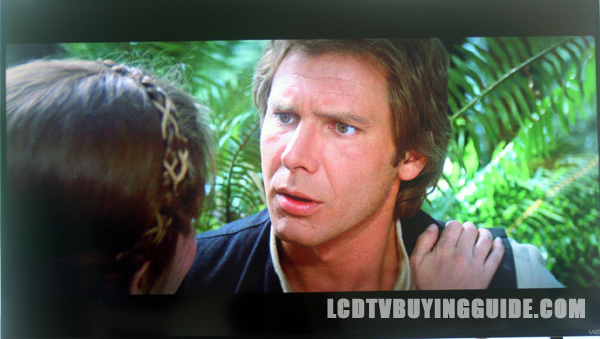 When viewing the BluRay remake of Return of the Jedi the TV did a very acceptable job with voice clarity and quality. There is plenty of volume even for a very large room. The Surround Sound feature is set to On which is my preference with fuller sound. Sound quality was more pinched without it. This is one of the best speaker/audio sets in the market. At $999 the M55-C2 is set up to be a winner. There are certainly small weaknesses, but they are overwhelmed by lots of positives – primarily the picture quality, upscaling, sound, Internet Apps processing engine, aesthetic package, 5 HDMI inputs, and color rendition. It's difficult to beat this combination for value. M60-D1 – $999. 120Hz panel. The 60” is the only size that has an IPS (in-plane-switching) panel which improves side angle viewing but hurts black levels and contrast from front and center. 64 Zone local dimming. M65-D0 - $1149. 120Hz panel. 64 Zone local dimming. M70-D3 - $1699. 120Hz panel. 64 Zone local dimming. M80-D3 - $3799. 120Hz panel. 64 Zone local dimming. All of the Vizio M-series size models are an excellent value. The 80” size is novel so not as great a deal. 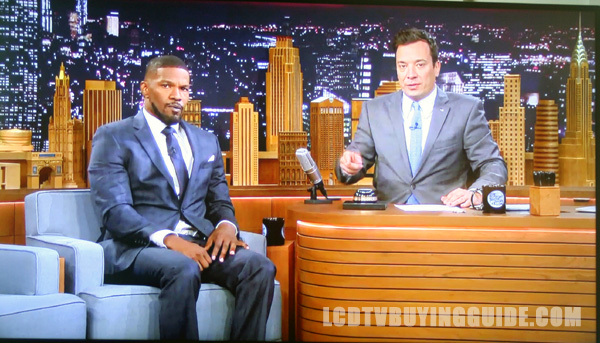 The 60” and 65” really stand out from a per square inch value perspective. The local dimming, and overall picture quality for the money are the standout features in my mind. Sound quality is also pretty good even without a sound bar. The Apps selection is great also.